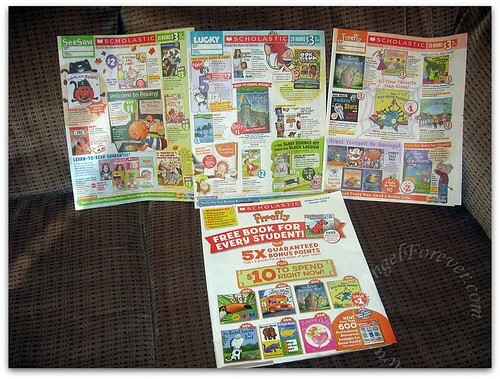 Do you remember getting the Scholastic Book Club flyers sent home from school when you were a child? I do and I remember spending hours sifting through them to see what was included on each. When I became a teacher, this continued. I kid you not, hours were spent looking to see what items I wanted to add to my personal library. Now, as a parent I continue on tradition. When JSL started nursery school, they asked parents to sign up for committees to help with items. I immediately put my name down for the classroom Scholastic Book Club parent. This was SO up my alley. At Open House last week, I found out I was the only person that wanted to do this. The next day, I was greeted with the following in JSL’s cubby. I went home, set a date and got them ready to distribute to the other parents in the room. Today, I also finished getting the online ordering location ready. I love this since it allows parents to see even more book options than the ones in the flyer sent home. It also credits the classroom with a free $3 book for each online order placed. A huge win win for classroom libraries. NHL also came home that day with his Scholastic forms. Here is everything that I have been working on, while reading with the boys. It helps to explain part of why I am not posting a book review for Tuesday Tales this week. Remember, support your child’s classroom and order some books from Scholastic. They have a great selection for all reading levels and many different price ranges. Books make great presents and never need batteries. Just an FYI – I am posting this out of my love for all things Scholastic through the years. Thank you to the Twitter Scholastic representative for their assistance the other day. I love getting replies back for photos of books, questions and concerns. I always like tooting the horn of a company that genuinely cares about kids, teachers, schools and literacy. Next week, I will be featuring the book 1+ 1 = 5 and Other Unlikely Additions by David LaRochelle. This is a fun math related book that has a lot of activities that can be done with it. Disclosure: I have been a life long Scholastic customer as a student, teacher and parent. No compensation was given for this post, I simply wanted to share what I have been up to. Of course, I am open to the idea of working with Scholastic (*hint* *hint* *nudge* *nudge*). The Amazon widget is for our Amazon Affiliate where I will receive a percentage of money for the sale of the book and other items in our suggested items. « And the winner is. . .
1 + 1 = 5 was reviewed on 5M4B recently, sounds like a cute book. I’m looking forward to your review. 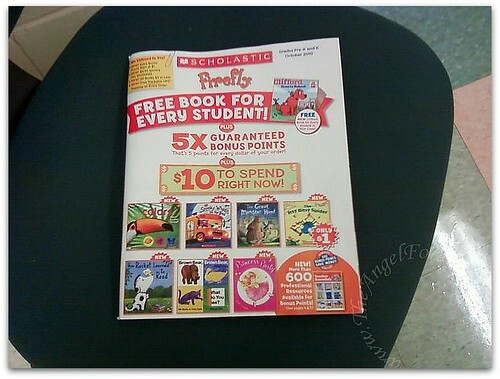 I’ve never actually bought anything from Scholastic but I think next time the flyers come home, I will make a purchase. I always buy at the book fairs though. I *heart* Scholastic! When my son started going to preschool last year and one day came home with the monthly Scholastic catalog and order form, I was in heaven! I usually bought $10-$30 worth of books and things every month. Looks like you hit the jackpot there! We only get the Firefly level of books (the one for preschoolers). In my last order, I got four of Mo Willems’ pigeon books. Yay!